The Fieldbus Foundation recently announced the release of an updated version of our FOUNDATION for Safety Instrumented Functions (SIF) technical specifications. The specifications now include support for FOUNDATION fieldbus H1 (31.25 bit/s) dual-mode devices employing powerful field diagnostics capabilities, which greatly simplifies the process of developing field instrumentation employing the SIF protocol. With the dual-mode H1 device capability, instrumentation manufacturers can bring new safety products to market without having to design two entirely different devices. Developers can implement H1 devices with SIF features activated or de-activated. More importantly, this means that plants will only have to stock one type of device that can be used as either a process device or a safety device. When SIF mode is selected, the device will behave as specified by the SIF specifications; otherwise, it will function as a normal H1 instrument. To ensure conformance to safety standards, the two modes cannot run concurrently in the same device. The latest Foundation for SIF specifications release includes a number of updates to the System Architecture, Application Model, Protocol, Function Block and Device ITK Profile specifications to make this all possible. It also includes a new application note on macro cycle calculation. FOUNDATION for SIF has the potential to greatly improve plant and process safety through superior advanced diagnostics at both the device and network level. FOUNDATION for Safety Instrumented Functions was approved by TÜV Anlagentechnik GmbH to meet the requirements of IEC 61508 up to, and including, Safety Integrity Level (SIL) 3. Process automation end users have clearly stated their desire for FOUNDATION for SIF technology because of its reduced footprint, reduced installed cost, and advanced diagnostics capabilities. Most of the failures related to safety systems do not happen within the logic solver, but can be traced to failures at the field device or control valve. FOUNDATION for SIF provides the most sophisticated diagnostics for safety devices and a truly digital path for safety devices. Multiple Foundation for SIF pilot projects are taking place at locations around the world with different end users. These companies, along with other major end users, are encouraging the automation equipment industry to develop safety-approved products for their initial installations. For more information about the Foundation for SIF Technical Specifications, please visit the Fieldbus Foundation’s Specification page or e-mail sales@fieldbus.org. We just returned from a busy two weeks on the road, one of them spent at Hanover Fair in Germany where we participated in the Field Communication Lounge. Five foundations, including Fieldbus Foundation, FDT Group, HART Communication Foundation, OPC Foundation and Profibus International all shared a large booth to promote our message of digital field communications and information management. 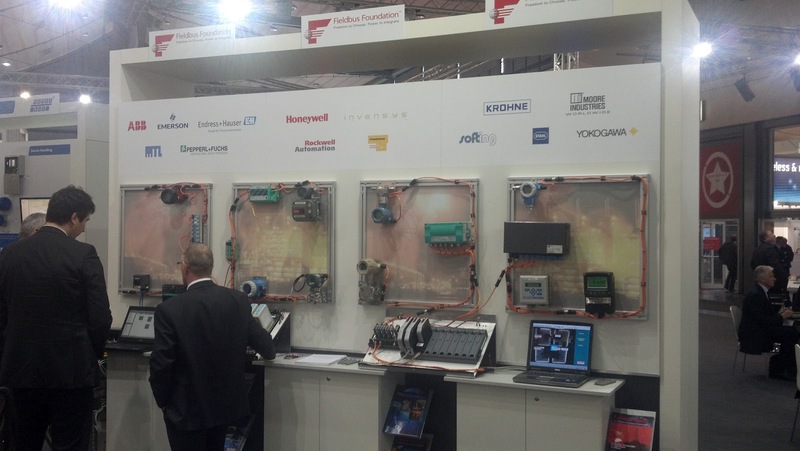 Fieldbus Foundation showcased our demonstration units that we use for our seminars in Europe, the Middle East, and Africa. These are designed to be “hands on” demonstration units that allow users to find out for themselves that FOUNDATION fieldbus is easy to use. 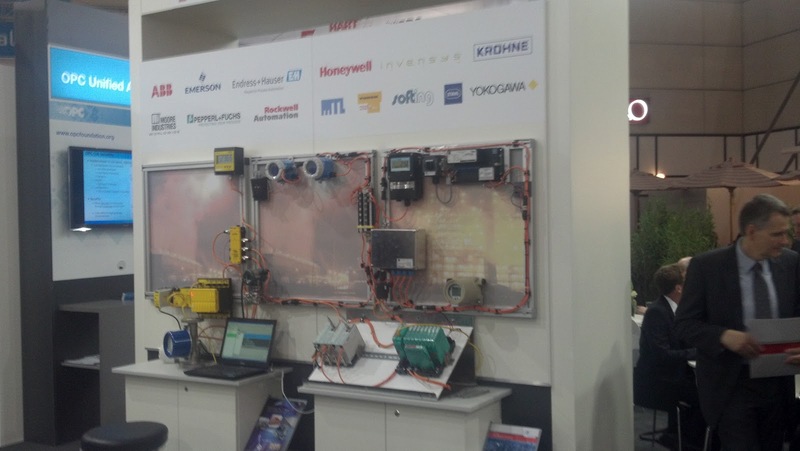 The three demonstration units include hosts from Emerson, Honeywell, and Endress+Hauser and devices from a wide range of suppliers. I also gave several presentations at Hanover highlighting our efforts in FOUNDATION for Remote Operations Management (ROM) and FOUNDATION for Safety Instrumented Functions (SIF) technology. We will return to Germany in a few weeks to participate in the Field Communications Lounge at the Achema show in Frankfurt. Achema is the very big show that focuses on the German chemical industry. While Hanover’s focus seems to be leaning more toward factory automation, the Achema show is most definitely a process automaton affair. Last week we were at Lee College in Baytown, Texas, which is one of our certified training centers under the FOUNDATION Certified Training Program (FCTP). Our purpose for being at Lee was to organize our demonstrations and presentations for our series of upcoming seminars in North America. Our first seminar will be in Calgary at the TELUS Convention Center on May 23rd. You can register online for the seminar here. We have made many changes this year and we welcome our new host system demonstration supplier Invensys Operations Management, as well as our returning demo suppliers Emerson Process Management and Yokogawa. Our full list of sponsors for the seminar is available here and includes Cobalt Process, Emerson, Endress+Hauser, Invensys, MooreHawke, MTL/Cooper, Pepperl+Fuchs, Phoenix Contact, Stahl, Rockwell Automation, Southern Alberta Institute of Technology (SAIT), Westlock, and Yokogawa. Check out our new logo for FOUNDATION for Safety Instrumented Functions. It is the same design as our FOUNDATION for ROM logo.